When I was a kid growing up, A&W root beer was not just a drink that you bought at the supermarket. It was also a restaurant where you drove your car up and was waited on by a girl who came to your car, and your food was served on trays that hung from the driver’s side window. But the best part were those frosty mugs of root beer. It didn’t taste like the bottles and cans found at the store. Over time, they shut down this type of service, but the restaurants were still around. Unfortunately, they could never be found anywhere near where I lived in California. But when I arrived in Las Vegas 15 years ago, there were several of them in the valley. They took the form of a combination restaurant: half Long John Silver’s and half A&W. But one day, without warning, they shut them all down. The story I heard was the company that owned the restaurants sold them, but they sold each restaurant to a separate party, so all of the combination locations were closed. There were Long John Silver’s that existed by themselves. They survived. But all of the A&W restaurants disappeared, and no new locations have been built since then. Their closure made me sad because my little girl loved cheeseburgers, and we would go to every burger joint we could find. She grew up to be a bit of a cheeseburger connoisseur. I like the burgers, but I especially enjoy the diet root beer. They were one of the few fast food places that offered something besides diet cola. As a type 2 diabetic, this is greatly appreciated. There is still one location outside of Las Vegas that was a stand alone restaurant, and therefore, was never closed. Located in Boulder City, it is within driving distance of Las Vegas (about a 30 minute drive). 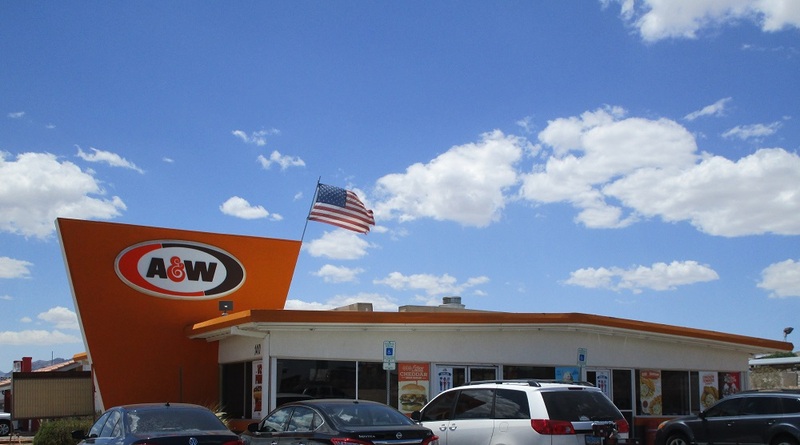 So if you don’t have an A&W in your home town and you want to eat at one, you have to journey out to Boulder City. There are several things to do out there, and I plan to begin writing about them in the near future.